Introducing our new DIY bracelet-making Bar! We have a unique collection of empowerment beads for you to customize and create your own personalized bracelet. Come on in to make your own bracelet! Or, you may order online and we will make it for you! You have three lengths to choose from. 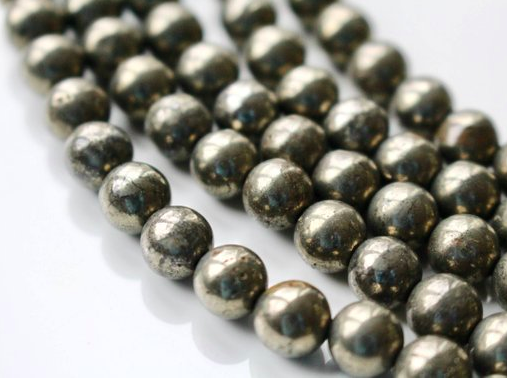 We are currently offering beads between 6mm to 10mm. Our standard sized beads are 8mm. Along with your bead choices, you will also be able to choose a charm option in silver or gold. Owing to its powerful filtering action, amazonite promotes clarity by dispelling negative energy, aggravation, and blockages within the nervous system. This soothing stone also supports universal love by encouraging empathy and balancing masculine and feminine energies. Representative of grounding, balance and truth. Also known as the stone of health, Pyrite contains both fire and earth energies, helping one to balance the root chakra. It is said to protect one both emotionally and physically, and helps to boost self-confidence. It is a wonderful stone for use in meditation as it is said to remove negativity, helping one to concentrate. Pyrite also increases stamina, stimulates the mind, and can help to ease depression symptoms. A stone of healing, turquoise provides protection and promotes purification by releasing negative energy. This stone also promotes communication between the spiritual and physical, fostering a sense of inner tranquility by aligning all of the chakras. With its ability to open and purify the heart, rose quartz is the most powerful stone for attracting love and peace. Furthermore, rose quartz helps one to both give and receive love, allowing one to perceive beauty of all kinds. Known as a stone of intuition, labradorite is thought to increase mental abilities while promoting creativity and imagination, enhancing the positive aspects of one's personality by minimizing traits that drain one's energy.